Seniors, the best kept secret! Let’s get that out of the way. Yes, you are correct. You may not have a senior Greyhound for as many years as you would have a youngster. However, as we all know, there is no guarantee that a young dog will live to be a senior. Losing a Greyhound is difficult no matter how old the dog is or how many years you have been owned by that Greyhound. It’s sad in any event. Many of us adopted Greyhounds that were young and they are now seniors. We all hope for that. My first Greyhound was three years old when I adopted him, and he died at age fourteen. Like many of us, I was hooked after the first one. 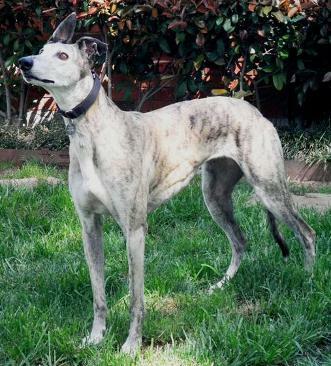 I lost another Greyhound at age 9 ½ that I had only had three years. There was no difference in my feeling about their deaths. We all strive to eventually have seniors through years of love. TAGS’ Greyhounds are seniors at age 9. That varies with different adoption groups and different breeds, so you may want to expand your definition to dogs somewhat younger than that. Now, look at the other side of adopting a senior Greyhound. These are dogs that are more difficult to place primarily because of the above reason. Adopting a senior Greyhound gives you a different feeling because I think the senior Greyhound feels differently. You can’t tell me that a 7 year old dog that has lived in a kennel all of her life isn’t more appreciative of a soft bed, quiet surroundings, petting, and human and canine companionship than a young dog that has less life experiences. There are brood matrons and studs that stay on the farm longer than that. I’ll give you an example. 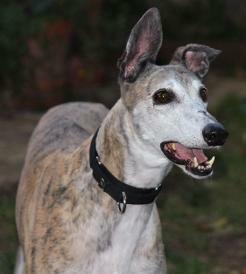 TAGS currently has an available Greyhound, Tippi, that was 9 years old in March, 2013. She ran 67 races, was retired to the farm, and had 2 litters of pups. When she first came to TAGS at age 8, she had lived either at a racing kennel or on the farm her entire life. It was apparent that she had never ridden in a car - only a dog hauler – and that she had never been in a house. I fostered Tippi initially. After a few stressful days in a new environment, she settled down and really took in her surroundings. She and the other Greyhounds in the home got acquainted quickly and all seem to get along fine. She scarfed down her food but later learned there was plenty more and it was not necessary to always finish first in hopes of eating a slower eater’s food. By bedtime she was definitely ready. She started out lying on the floor next to a dog bed but it only took a few minutes for her to ooch her way onto the dog bed. She learned to “load” into the car, loved to go for rides, and even relaxed somewhat a meet and greet events (as long as other dogs gave her some space until she felt comfortable). All of this began about 18 months ago. She has been in two other foster homes and adjusted well to each. She began soaking up love immediately. However, it seems that she is always passed over for adoption (for no particular reason unless it is her age). Tippi is not cat tolerant but many young Greyhounds are not cat tolerant either. Yes, you may not have a senior Greyhound for as many years as a younger dog, but I can guarantee that what years the senior Greyhound has with you will be the BEST years of the Greyhound’s life. In this, too, quality may win over quantity. You have the opportunity to give a senior or older Greyhound the absolute best life, no matter the length. It will definitely be appreciated.